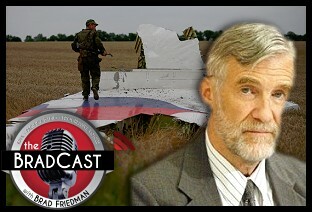 " 'No Good Evidence' Russia Behind Shootdown of Malaysia Air Flight 17 in Ukraine, Says Longtime CIA Analyst Ray McGovern: 'BradCast' 8/20/2015	"
« PREVIOUS STORY "'Green News Report' - August 20, 2015"
"'No Good Evidence' Russia Behind Shootdown of Malaysia Air Flight 17 in Ukraine, Says Longtime CIA Analyst Ray McGovern: 'BradCast' 8/20/2015"
McGovern was also DEAD WRONG on Syria and the supposed "false flag" gassing massacre of the rebels' own families (yeah right). His assessment is fact free opinion, a smear attack that just happens to feed Putin's massive propaganda machine. Just search the web for 'MH17' and 'blame', it is staggering the effort to deny Russia's guilt. The Dutch Safety Board finds BuK missile fragments at the crash site, reported 9 days ago. So what is your evidence that he was "dead wrong" in regard Syria? Because both he and VIPS stand by that assessment to my knowledge, even today. Sounds like you didn't actually bother listening to the interview you're commenting on, so I'll have to assume examination of actual evidence isn't your strong suit here. Even if they were responsible for firing the missile, it isn't as if they purposefully shot down a commercial airliner. The pilot turned a routine flight into a suicide mission by leaving the flight corridor and flying over a war zone, presumably to save fuel. The Western press often referred alleged russian anti-aircraft complex with No. 312. The security service of Ukraine also published photos "BUK" No. 312 and said alleged it Russian "BUK". This video with BUK-M1 №312 appeared as "proof" of guilt of Russia on CNN. Actually, It was a Ukrainian complex in service with the Ukrainian army. On the Internet there is an interview with the Ukrainian military, who served at this BUK with №312. Now he's wanted by the Ukrainian security service alleged for treason, although he admitted in interview, that this is no he shoot down a flight MH-17. After this scandalous interview the security service of Ukraine stated that photo with BUK №312 was to get on to them on the official site as "proof" of guilt of Russia by mistake, but CNN still has not brought apologies to Russia for this falsification. Putin knows the case against him is iron clad and the evidence overwhelming. It s why he vetoed the UN tribunal.